People gathered at various parts of Kathmandu on Thursday—the 13th day of the deadly earthquake —to attendcandle-lit vigil in memory of those who died in the catastrophe that shook the nation. The death toll from the disaster has already reached 7,765 as of Thursday evening. The devastating earthquake also ravaged the historic monuments including Dharhara and three Durbar Squares of Kathmandu Valley enlisted as the world heritage sites. People erected a statue of Dharhara and lit candles at Sundhara, Sanepa, Maitighar Mandala, Basantapur, among other places of Kathmandu Valley. 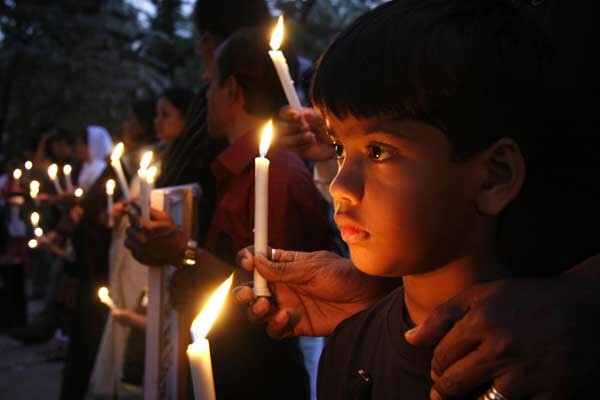 The participants held lit candles as they reflected on those who were killed and injured during the national tragedy.